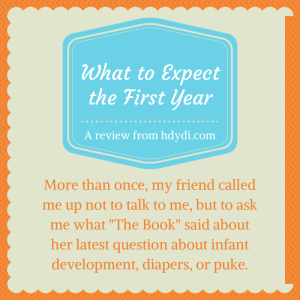 What to Expect the First Year – A Book Review | How Do You Do It? What to Expect When You’re Expecting is a classic that most moms have heard of even if they haven’t read it. It lays out all aspects of pregnancy (singleton pregnancy, mostly), from what’s happening within your body to possible complications to what will happen at your medical appointments and your childbirth options. What to Expect the First Year is another book in the same series. 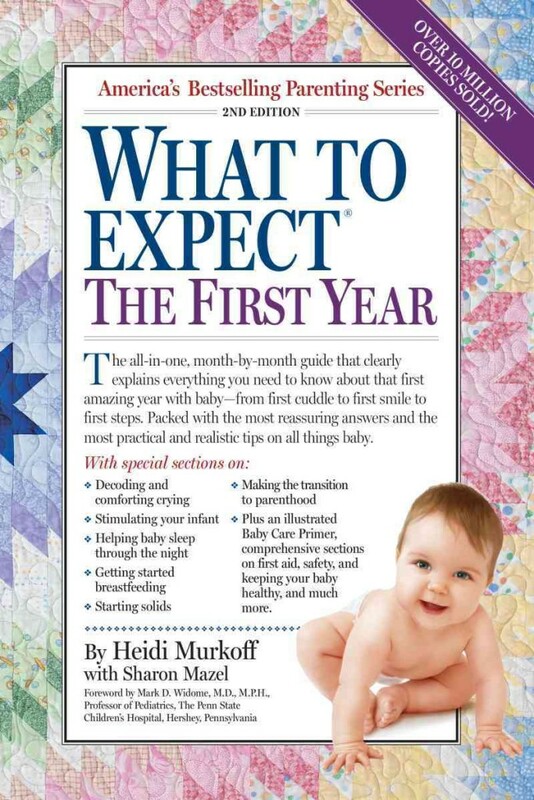 It is laid out similarly to its predecessor, but focuses on your child’s first year of life. It’s not the kind of book your read cover to cover. I certainly didn’t! Not with two infants showing up 2 months ahead of schedule, a full-time job, and a husband in Iraq! What it is, in my opinion, is the perfect reference book for that first nail-biting year of motherhood. It was my crutch as I discovered my maternal confidence and faith in my instincts. It was my touchstone, letting me know it was all going to be okay. During the period in which I leaned on this book, I hadn’t yet discovered the blogosphere and the kinship of other MoMs. My grandmother, the only member of my family I would have trusted with childrearing advice, had died when I was 19. My in-laws were supportive and loving, but they lived 2000 miles away. My neighbours were wonderful, but their babies were 2 and 6 months younger than mine. I was supposed to be the local expert on babies. Ha! I was cheating, passing off nuggets of wisdom from What to Expect the First Year as my own. The book isn’t perfect. 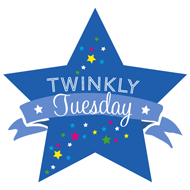 Its content pertaining to twins was limited, generic, and generally unhelpful. I was completely unprepared for the realities of prematurity and the NICU. What to Expect had failed to warn me about what it was going to mean to have a child with a birth defect or the challenges of getting it diagnosed. However, What to Expect the First Year covers 90% of parenting. For pregnancies and infants without major complications, it might get close to 99%. I started acting upon the advice in the early chapters of the book while I was still pregnant. Of course, while pregnant, I actually had time to sit down and read the first few chapters. It hadn’t occurred to me to select a doctor for my babies ahead of time, but when I read that recommendation in What to Expect, it made perfect sense. I lucked out in my search, the first practice I interviewed being The One. I had confidence bringing my 4-pounders home from the NICU knowing that I had a doctor I trusted with their care. I read through the section on preparing pets for a new baby voraciously, and was more interested than alarmed at our cats’ reactions to their arrival. I was an expert on matters of car seat choices, much to the pride of my husband. When we were registering for a travel system, I was able to show off my knowledge of what LATCH stood for. Yep, I’d read it in the book. When I heard J’s Apgar score, M was being pulled out of my body. I was grateful to have read that far in the book. I knew that her score of 9 was really, really good, especially for a 33-weeker. I hadn’t, however, prepared myself to have my wrists strapped down or for the doctor to tell me he was going to have to cut, whether or not my epidural had kicked in. M has a fever. Do I call the doctor? I check for “fever” in the index and learn that anything over 100.4 °F for my newborn meant a call to the doctor was in order. J is refusing the breast. What do I do? I read through the entire section on breastfeeding and am inspired again to try contacting La Leche League only to, once again, get no response. I had crazy food allergies as a kid. What can I do to minimize the chances of my kids suffering as I did? I read through the “thinking about solids” section and come away with an understanding of the American Academy of Pediatrics‘ recommendations. I also google the Great Ormond Street recommendations in a nod to my British heritage. I looked to the staff at the pediatrician’s office as my real partners in figuring out what to worry about and what to let go. They were very knowledgeable about what to schedule based on my daughters’ age adjusted for prematurity: introducing solid foods, immunizations, watching for developmental milestones. They were the ones who let me know that it was okay to have babies in the first percentile for length and weight as long as their growth curve mirrored the shape of the standard curve. For the everyday questions, though, that didn’t rise to needing to call the doctor, this book was my source of knowledge. 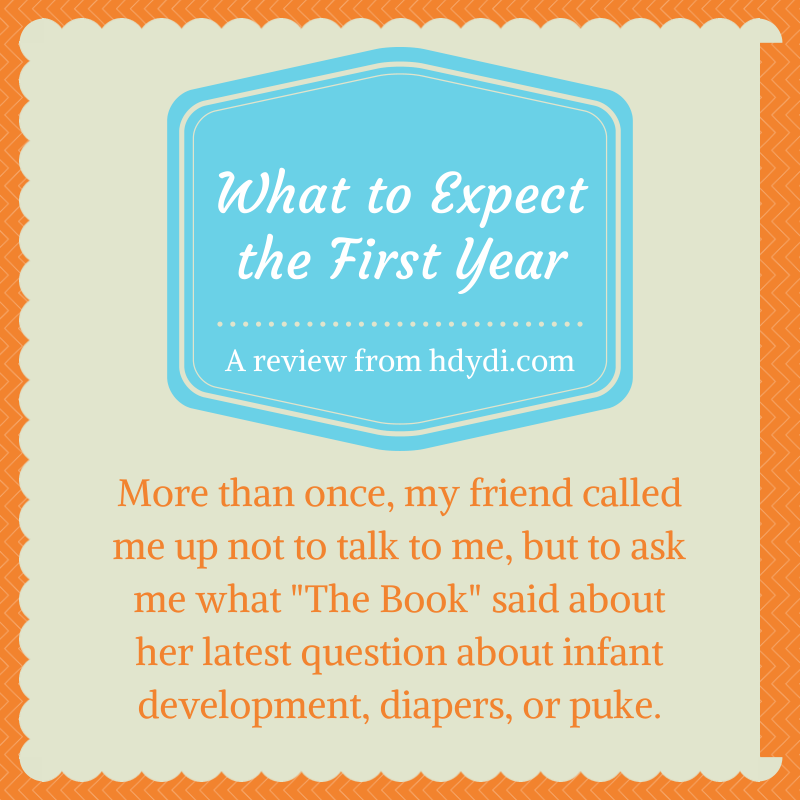 More than once, my friend Sara, her son 14 days younger than my girls, her husband deployed with mine, called me up not to talk to me, but to ask me what “The Book” said about her latest question about infant development, diapers, or puke. This was nearly 8 years ago. A lot has changed in that time. If I were to have newborns now, I’d be much more likely to turn to the internet. I’d have other mothers to turn to. I’d be more confident in knowing what advice to adopt and what to reject. For a first-time mom with a limited support network, though, What to Expect the First Year was indispensable. I just received this book yesterday from my insurance company and look forward to using it as a reference. I’m on bedrest now and have read through “What to Expect when You’re Expecting” and agree that it is a good reference, but leaves out a lot of specifics for multiples and high risk pregnancies. How far along are you? We’ve got a number of moms in the group who are bed rest survivors. I know it can feel very lonely. Kathryn, not sure if you’ll see these replies, but I am a bed rest survivor and wrote a book about it that’s available on Amazon. It’s called Beating Bed Rest. If you do see this, reach out to us somehow and mention it – I’d love to gift you with a free copy, courtesy of all of us at HDYDI. Sadia, I liked this book, but I got bored with it quickly because I had to keep reminding myself to go by their adjusted age. LOL. It was so frustrating and then I’d peek at where they should be and get discouraged. It’s definitely a good resource, but for my 27 weekers who were born very, very sick, it missed the mark.